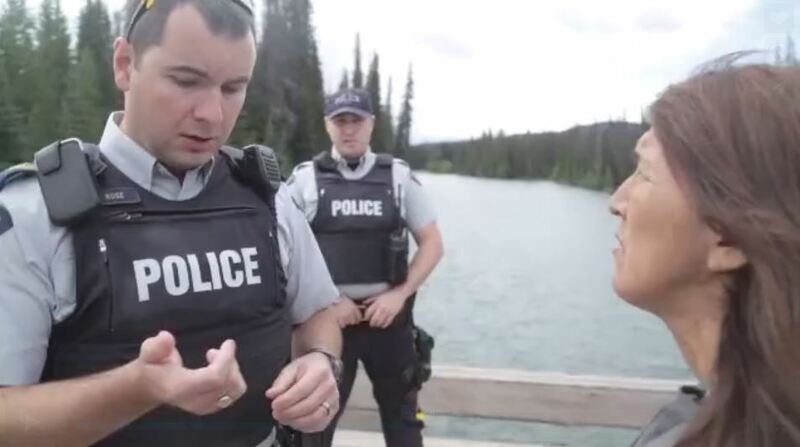 RCMP at the Unist’ot’en camp speak with Unist’ot’en spokesperson Freda Huson, July 2015. Late Friday (August 28), the B.C. RCMP issued a statement denying it plans to move against a First Nations camp that stands in the path of oil and natural gas pipelines proposed to traverse the province. As previously reported by the Straight, the B.C. Civil Liberties Association (BCCLA) sent a letter to the RCMP warning against “an impending, and possibly large-scale, RCMP action in relation to the Unist’ot’en camp”. That followed the publication of a similar letter signed by a long list of organizations that range from environmentalists to civil-liberties advocates that’s titled, “We Stand with the Unist’ot’en”. One of the first big LNG pipelines has been approved by B.C. after an environmental review, but First Nations say they could yet oppose the mega-project and others like it. TransCanada’s $4.7-billion Coastal GasLink pipeline to Kitimat was given approval Friday, although the project only goes ahead if the project it fuels is given the green light. Shell and its partners have yet to give a positive final investment decision to the $12-billion Canada LNG project meant to tap into Asia’s growing appetite for energy.